Welcome to the Styled & Set Holiday Tour! This year the beauty & creativity in store for you is incredible & inspiring. If you are coming over from Citrine Living welcome! Thanks to Lory of Designthusiasm for organizing the event. My table is styled & set with highs & lows and the warm neutral palette I love. On my thrifted old pine table metallics mix with grain sack. Creamy roses peek from an estate sale lidless tureen. 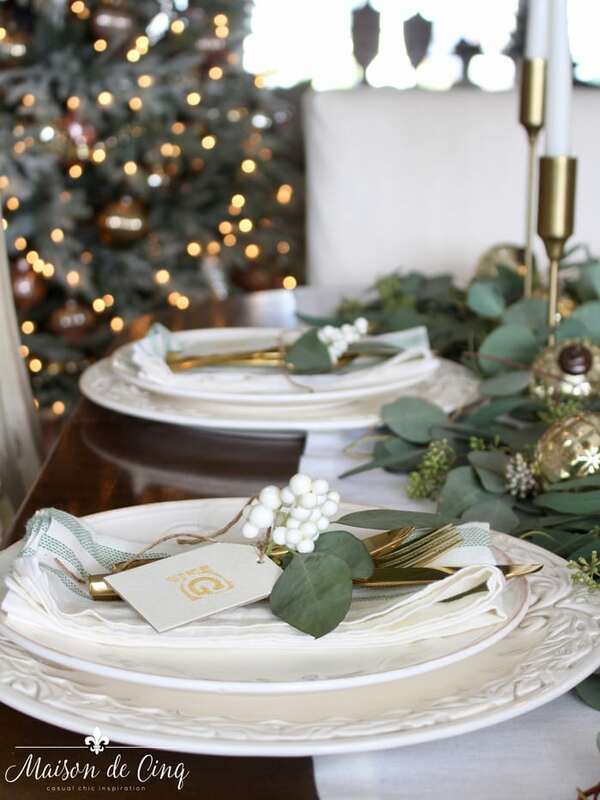 White plates are stacked on shimmery napkins. Greens from the yard are tied with baker’s twine & placed next to my wedding silver. I love the juxtaposition of it all. Thinking about it, you could say my decorating style is epitomized on this table as well as the room itself. If you want to see more of my dining room watch this VIDEO TOUR – click HERE. 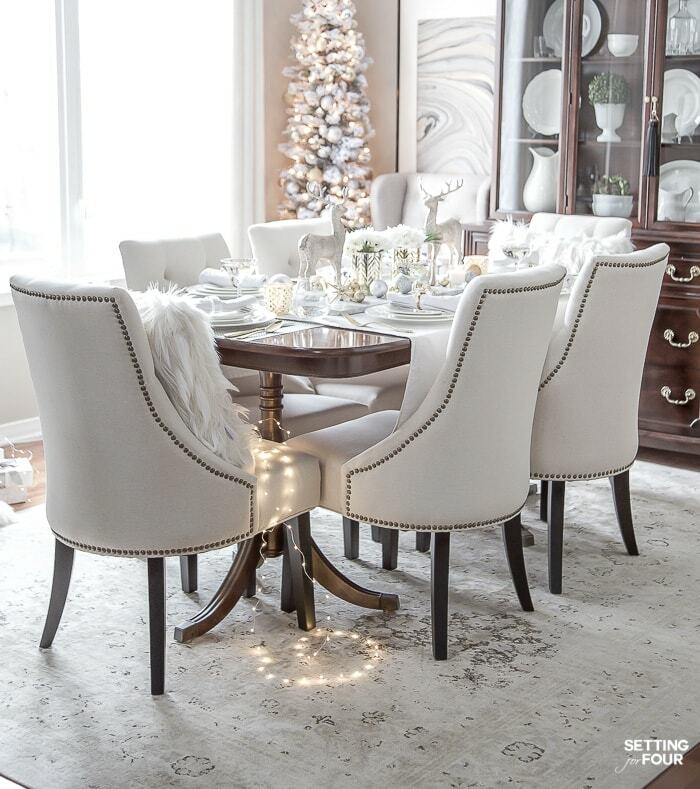 Pull up a chair and I’ll tell you about the look & give you a few tips to use on your holiday table. 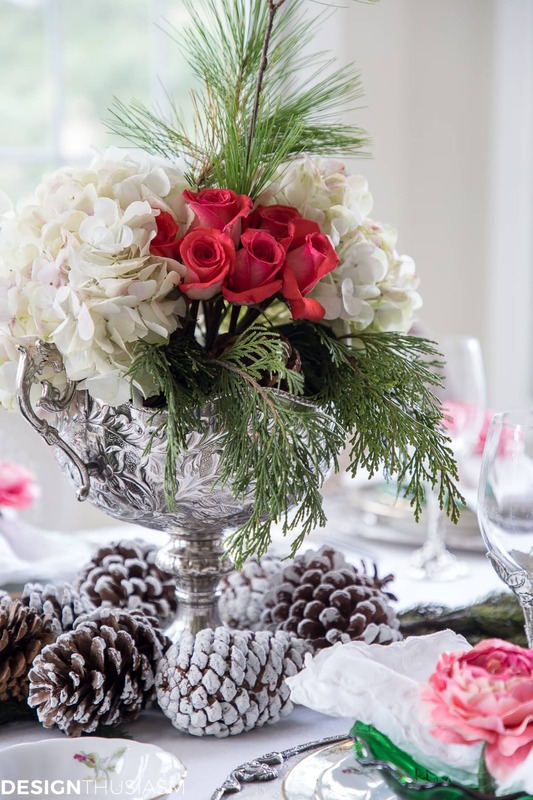 I shopped my house to design this table, including digging deep in a cabinet to pull out the wedding silver! And you know what…? It is not going back. We are going to use it regularly! The only aspect of this table that is new to me are the sheet music utensil holders. The vintage inspired sheet music is so charming holding my wedding silver. These would be wonderful as a pockets to hold a gift cards too! You can find these pockets in my shop, Bespoke Decor. Click HERE. Speaking of Bespoke, we have a $200 gift card give away going on now. Jump in on it by clicking HERE. Use your “good stuff” and mix it all with thrifted or humbler finds. This makes your table interesting & approachable. Create a low and sprawling centerpiece or create a grouping of smaller arrangements that can be broken apart at dinner time. See a VIDEO on doing just that HERE. 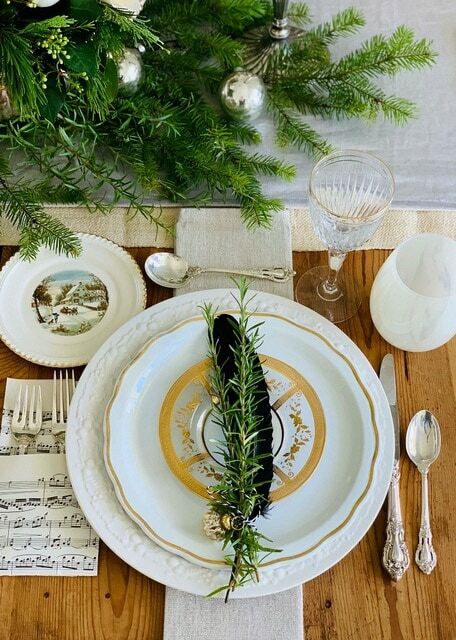 Make each place setting special with a little something pretty to take home. I bundled up rosemary and a black feather with baker’s twine and tied on a little ornament. You could add a tag and make these place cards. Add something fun & unexpected. This year my expected touches are the sheet music utensil pockets. Now head over to Heather’s table at Setting for Four. It is STUNNING!! The rest of the tour line up is linked below. I know you will love each post! This is all so beautiful and elegant, Kelly! I love the music note paper for the flatware. 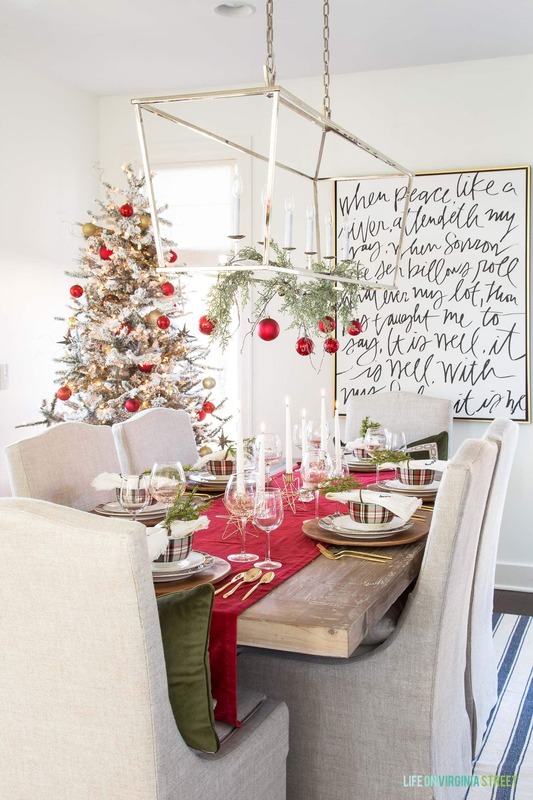 I love the way you styled your table! It’s elegant but approachable! Can you please give me some details about the table itself? Where did you buy it? Thanks! I love the way you styled your table! 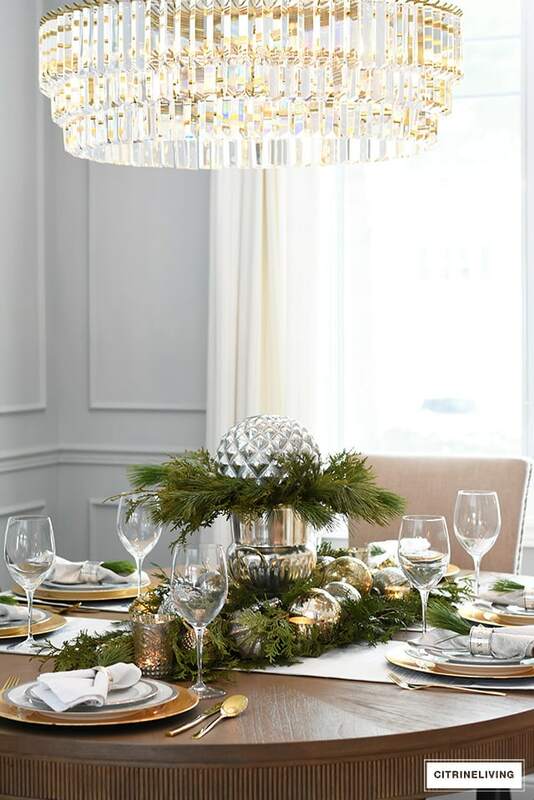 It’s festive and elegant. Can you please give me more details on the table itself? Where did you buy it? Thanks! So beautiful!! Love the feathers and greenery! Merry Christmas Kelly!